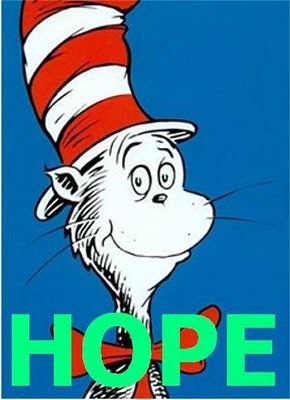 Barack Obama channels Dr. Seuss. As every American has been reminded daily for well over a year, we are blessed to be ruled by an historic prodigy who is by far the most brilliant and qualified individual ever to set foot in the Oval Office. Not merely the greatest politician, orator, and Constitutional scholar of his generation, President Barack Hussein Obama's overpowering intellect qualifies him to pontificate as an expert on any subject, from geopolitical history to geography to foreign language. Now here's the point: When your parents tell you to eat your broccoli [and] you don't yet know whether you are going to like them or not, you got to try them! Only the Almighty can say what the good doctor's reaction to this nugget of unexpected wisdom might be. As literary criticism the President's observation may be open to debate. We have to pass the bill so that you can find out what is in it! So goes the old rhyme: "Open your mouth and close your eyes, and I will give you a great surprise!" One difference: When your mom says this, you're probably going to wind up with a piece of candy. When the bully on the playground tries it, though, you're more likely to eat dirt. Well, America has had its nose held and been forced to swallow. Obamacare has not been down the hatch long enough for proof positive, but it sure tasted like dirt going in. Are our rulers kindly, all-knowing parents? Or are they more like the playground bully? If you don't appreciate being treated like a child, you know who to vote for in November. But if you're just feeling a bit queasy and want Mommy to give you some medicine, well, you can only hope the next book on Obama's reading list isn't Karl Marx's Das Kapital. The question you're asking is, which segment of the voters is bigger, the one that will eat whatever the government crams at them and vote for more so long as they don't have to work for it, or the segment that would prefer to eat what they earn themselves and have government leave them alone? kinda reminds me of the first 8 yrs of this decade, when we were asked to swallow the deception of alleged terrorists in Iraq & WMD and the advisability of locking ppl up w/o being charged [Gitmo], let alone convicted of a crime, that our schools need federal interference with NCLB, our businesses need monitoring with Sarbanes-Oxley Act, our personal lives & banking needs require federal control with the anti-Patriot act.. et cetera... where were you when Bush/Cheney were demolition our liberty, and why do you think the lies only started last year?